[New for 2012] Let's start with the disclaimer that I am a big fan of yoplait yogurt, the original (red) style in particular. It's just been my go to yogurt for years, usually the raspberry flavor but more recently I will mess with mountain berry or mixed berry for my mid-morning snack. 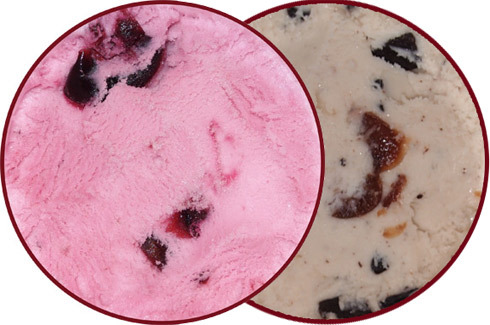 When I went to the store, I decided on cherry (such a popular froyo flavor) and mixed berry. I figure they've both got a decent chance of being winners. First open is Cherry Orchard (on the left) with a sneak shot of Ben & Jerry's Cherry Garcia on the right. I just couldn't resist the urge to compare the two visually. 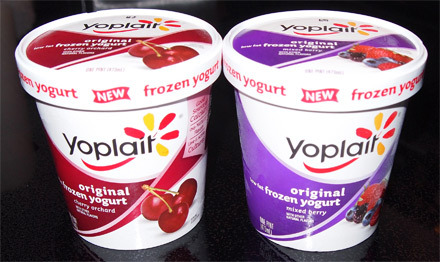 After a few small servings, I will admit that the cherry yoplait is decent, if not tame shall we say. There's just something about it that doesn't satisfy me. Hmmmm, let's try the mixed berry instead. The scary thing is just how much the froyo tastes like the regular variety but in a disconcerting way. I feel liked I've taken my regular yogurt, put it in the freezer, and then started scooping away. Sure, it's not quiet that solid, you can see all the air ripples in the photo, but man does the texture come across as so very flat. I'm just confused because I've had this yogurt flavor dozens and dozens of times, yet I can't finish a simple serving when it's frozen? That just seems weird to me. I literally was so bored after a few scoops that I put it back in the freezer and finished off the cherry orchard instead. At this point, I've lost the urge to try any of the other flavors. 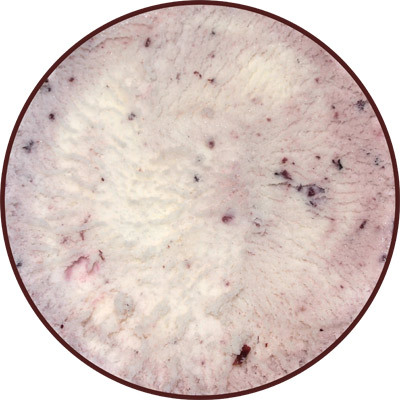 In fact, I think the mixed berry froyo has partially killed my appreciation for their regular mixed berry yogurt. I tried pawning off the mixed berry on my wife, and while she will finish it off for me, she'd prefer I pick up something else next time. You know, it's not that they are terrible, I'm just bored. I'd rather go eat sherbet or something. I said the exact same thing about their frozen yogurt bars. tasted like someone took a regular yogurt and froze it on a stick. yoplait should take notes from TCBY. Not so...we just discovered the bars and they're awesome. The caramel ones (Greek low fat) are better than a reg ice cream bar! Yoplait's vanilla frozen yogurt is an excellent.